Fig. 1: Schematic diagram of the processes involved in pump-probe spectroscopy of InAs/GaAs quantum dots. Quantum dot (QD) photonic materials have attracted much study in recent years as they have the potential to deliver the stability and coherence of atomic sources within a compact and efficient semiconductor device. Characteristics such as reduced sensitivity to optical feedback and reduced alpha parameter have made such materials attractive as laser sources. Also, the suppression of pattern effects in QD semiconductor optical amplifiers (SOAs) shows promise for high speed applications. The understanding of the high speed carrier dynamics of these materials is crucial for their optimization and exploitation. To address this issue, time resolved spectroscopy has been used to investigate the fundamental carrier decay time scales of SOA structures and determine their suitability for high speed applications. Digital optical techniques and components are vitally important in present day ultrafast communications networks. Recently, there has been much interest in using quantum dot semiconductor optical amplifiers (QD-SOAs) as non-linear elements for high speed optical switching. The basic element in high speed digital processing is a fast gating device, such as the SOA, where one optical signal controls a gate that switches a second optical signal. To evaluate the suitability of QD-SOAs for different ultrafast systems applications, a detailed understanding of the gain and refractive index recovery is essential. Time-resolved spectroscopy has long been used to investigate the fundamental carrier decay timescales of novel semiconductor optical amplifier structures to determine their suitability for high-speed applications. We have used a heterodyne pump-probe method to determine the dependence of the capture time of InAs/GaAs quantum dots on bias current. (For details on the pump-probe technique, click here). The measured power law relationship between these two quantities was in good agreement with a model which assumed Auger dominated capture and recombination processes. This finding is important for future optical information processing applications since it implies that the recovery time of the ground state gain should be extremely fast for sufficiently high current levels. By examining the absorption recovery dynamics, we demonstrated that the hole redistribution processes are extremely fast (1 ps) due to the effective mass asymmetry in InAs QDs. 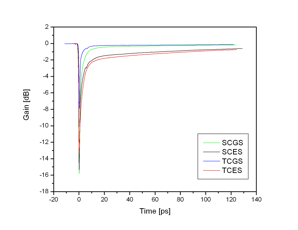 In addition, we have analyzed the gain dynamics far above transparency and found that the ES-GS relaxation is also a fast process, while Auger mediated electron capture to the QD constitutes the main limiting time scale in these devices. We have developed a rate equation model which is in good agreement with experiment. Such results are extremely relevant for the engineering of the next generation of high speed optical components such as regenerators and logic gates as QDs may offer opportunities due to their unique carrier dynamics. Fig. 2: Gain regime in InAs/GaAs QDs, showing the recovery of the probe transmission at 200mA. Single colour pump GS probe GS (SCGS-green), Single colour pump ES probe ES (SCES-black), Two colour pump ES probe GS (TCGS-blue), Two colour pump GS probe ES (TCES-red). Fig. 3: Gain and phase recovery in QD semiconductor optical amplifier.